Pairing Sylvester Stallone and Robert De Niro in a boxing comedy was a bad idea from the start. Grudge Match sounded like a gag when it was first announced. The 67-year-old star of six Rocky films goes toe-to-toe with the 70-year-old star of Raging Bull? Once the trailer was released, it became clear that this was Rocky Balboa-redux. In that 2006 film, Rocky comes out of retirement after a televised computer-generated fight ponders whether the Italian Stallion’s old school style would be any match for the current champ. 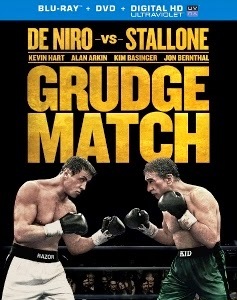 In Grudge Match, it’s also a virtual fight – based on a videogame motion-capture session – that brings former champs Henry “Razor” Sharp (Stallone) and Billy “The Kid” McDonnen (De Niro) back to the ring. A trio of screenwriters and director Peter Segal came up with a string of tired old-age jokes and an uneasy combination of often-raunchy humor with a family-film atmosphere. Segal debuted 20 years ago with Naked Gun 33 1/3, so maybe it makes sense that Grudge Match often feels like a parody of the Rocky films. Stallone’s initial instincts, revealed in interviews after the film’s release, were correct: the film is a bird-brained comic take on his Rocky films. Stallone knew it when he read the script and acknowledged its parody elements after the film’s release. Unfortunately, he listened to De Niro – who was inexplicably jazzed up about the project. The plot focuses on the long-standing rivalry between Razor and Kid, one-and-one against each other. Their third fight – the one that would ostensibly decide who was the superior boxer – never came to be. Kid knocked up Razor’s girlfriend, Sally (Kim Basinger), which only strengthened their status as enemies. Kid went on to run a used car lot and a nightclub. Razor lives modestly, working in a factory in order to keep his former trainer, Lightning (Alan Arkin), comfortable in an old folk’s home. Dante Slate, Jr. (Kevin Hart) is the son of a deceased Don King-type promoter desperate to establish himself. He reunites Razor and Kid for a new videogame and the filmed violent outburst that ensues goes viral. Public demand builds and soon enough, the oldsters are training; Razor with Lightning, Kid with his estranged son, B.J. (Jon Bernthal). 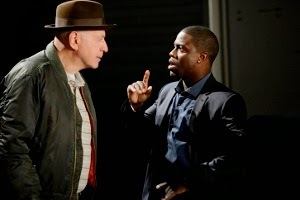 Kevin Hart has the most fun with his role, working hard to pump up the energy level. De Niro exudes considerable enthusiasm as well. His hard-drinking, womanizing, bad grandpa (to young Trey, played by Camden Gray) is by the far the more interesting of the two leads. Stallone mostly mopes around, looking like he wished he hadn’t signed on after all. His rekindled romance with Sally is awkwardly handled. Rather than a touching example of long-overdue forgiveness, Razor’s acceptance of Sally makes him look rather like a chump. She couldn’t resist cheating on him with Kid and subsequently starting a family. And after years of living alone in understandable resentment, he falls right back in love with her when she shows up 30 years later? Pathetic. 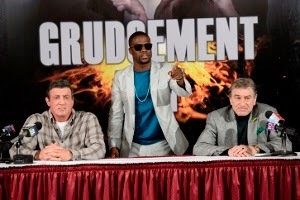 It should be said, there are a few decent chuckles sprinkled throughout Grudge Match. But the training sequences – and especially the big fight itself – are treated with such serious reverence that all the good-natured humor is essentially undone. All involved treat the fight as if it was a genuine Rocky fight. The jokes are non-existent. 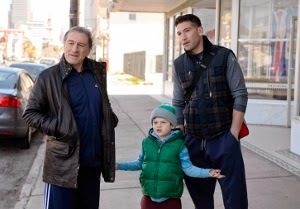 All we’re left with is the sight of two past-their-prime actors (De Niro is particularly unconvincing at this point) “going the distance.” And for what? Even at their most ridiculously over the top, the Rocky fights packed a palpable emotional punch. We care about whether or not Rocky wins (even in the silly street fight that ends Rocky V). In Grudge Match, there is really nothing at stake. That would’ve been fine if the laughs had continued, but by taking the whole thing way too seriously they sunk the already listing film. Blu-ray specs are exactly what anyone would expect from a mid-budget, studio-produced comedy. It’s not much to look at or listen to in the first place, but the high definition transfer and lossless DTS-HD MA 5.1 mix are entirely acceptable. For whatever reason, a slightly dark look was favored for Grudge. The results could charitably be called “naturalistic,” but the end result is that detail is often a bit lacking in shadier scenes. The punches land with satisfying, resonant thuds during the fight scenes, but surrounds are mostly engaged for crowd noise and the frequent rock soundtrack tunes. Fans of Stallone and/or De Niro will be sorely disappointed that they did not contribute a commentary track. That’s what I was hoping for, but alas there is no commentary at all. Instead we get about a half-hour of promo-style featurettes, two of which center on Kevin Hart. More interesting are the alternate opening (which gives us before-and-after shots of Stallone and De Niro’s “young” stand-ins, juxtaposed with the final film’s CG-“de-aged” shots), deleted scenes, and two alternate endings (one of which that easily should’ve been used in the film). Grudge Match is at its best during a post-credits scene with two real-life former heavyweight champs, which hints at a better movie lurking behind the ultimately botched final product.